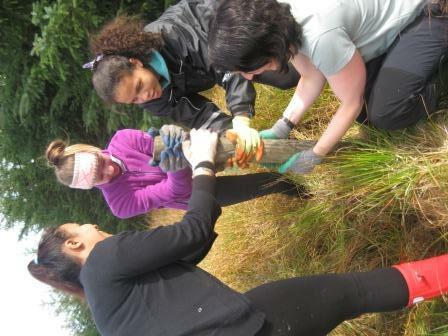 The Green Team, which receives its core funding from Scottish Natural Heritage, will be celebrating 20 years of working with young people in 2015, conserving Scotland’s natural landscape and wild places across Edinburgh, The Lothians and beyond. And what better way for this milestone to be celebrated than with the creation of a new woodland called The Green Team Wildwood. The site at Glenlude in Innerleithen in The Borders is owned and managed by the John Muir Trust, an organisation that The Green Team has had close links with for many years. All participants of Green Team projects are encouraged to complete at least one level of the John Muir Award. It is intended that The Green Team will manage their new woodland with the help of the hundreds of young volunteers and school pupils who come to The Green Team each year to learn real hands-on conservation and environmental skills. This will enable the charity to develop a long-term relationship with the woodland with the hope of enhancing the space with a log cabin shelter in the years to come. The Green Team has been fortunate to have been granted 400 trees from The Woodland Trust for this new woodland and volunteers have already been on site this month to start the creation of a brash hedge enclosure which will protect the trees from the hungry deer population. The main tree planting will take place on Sunday 15th March from 1-3pm as part of the charities 20th Anniversary celebrations to which everyone is welcome. Those wishing to sponsor a tree can do so by completing and returning a Green Team Tree Sponsorship e-flier or by emailing admin@greenteam.org.uk in the first instance. All monies raised from sponsorship donations will go directly towards the charities minibus fundraising appeal. The Green Team celebrates its 20th birthday next year and in that time the small charity, which is based at Tynecastle High School, has worked with nearly 4,000 young people to learn about, and participate in, the conservation of wild places and green spaces throughout Edinburgh, the Lothians and further afield. The Green Team was recently announced as a finalist in two categories of the RSPB Nature of Scotland Awards in recognition of their work in Youth and Education and Community Projects. The winners will be announced on 20th November 2014.